Located near Diamond, Missouri, the George Washington Carver National Monument was the first unit of the National Park Service dedicated to an African American and the first national monument dedicated to a non-presidential figure, honoring leading 20th-century inventor, botanist, and environmentalist George Washington Carver. Though his exact date and year of birth are unknown, George Washington Carver was born as a plantation slave in Diamond Grove, Missouri between 1861 and 1865. Within the first week of his life, he was kidnapped by raiders from Kentucky along with his mother and sister, though he alone was recovered by efforts from his master, Moses Carver. Following the abolition of slavery during the American Civil War, George and his older brother James were raised as part of Moses’ family, with Moses and his wife Susan encouraging both boys to pursue intellectual interests. After being rejected from application at Highland University in Kansas, Carver became the first African-American student of the Iowa State Agricultural College, earning a master’s degree in botany and operating an experiment station focused on plant mycology and pathology, which brought him national recognition. Throughout his career, Carver taught as an instructor in the agriculture department of the Tuskegee Institute, creating a mobile learning program inside a “Jesup wagon,” named after financial backer Morris Ketchum Jesup. He popularized a number of widely adapted farming rotation techniques, including the planting of sweet potatoes and legumes as a means of revitalizing overfarmed cotton fields, which earned him the nickname “The Plant Doctor.” A farmer’s bulletin on the farming of peanuts gained him widespread national acclaim, earning him celebrity status as a public speaker on both agriculture and racial issues. As the result of his extensive work, Carver became the leading African-American public figure of his time, earning him the nickname “Black Leonardo” in a 1941 Time magazine feature. Following Carver’s death in 1943, $30,000 of funds were dedicated toward the development of a national monument in his honor, encompassing a number of preserved sites connected to his boyhood home, by President Franklin Delano Roosevelt. Today, the George Washington Carver National Monument spans 240 acres near present-day Diamond, Missouri, including the preserved 1881 Moses Carver House and surrounding fields where Carver spent his childhood. A Visitor Center serves as an entrance to the monument, which contains a small museum with interactive exhibits on Carver’s life and scientific advancements, as well as a bookstore and a theater presenting a short orientation film. An observation deck also allows for views of the area’s rolling hills and expansive prairie woodlands. Along the one-mile Carver Trail, visitors may explore the woodlands and streams of the area along a self-guided loop, along with several historic sites connected to Carver’s life. The Carver Cemetery contains the grave sites of Moses and Susan Carver, though George himself is buried at a site at Tuskegee University. 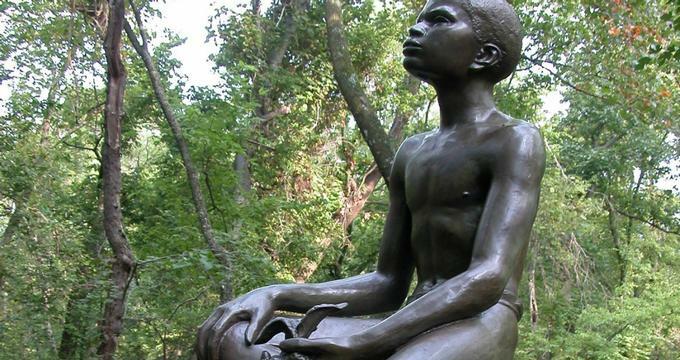 The park’s Boy Carver Statue, commissioned in 1960 by sculptor Robert Amendola, sits near a bridge in one of the park’s natural areas, and a pond on the former Moses property, Williams Pond, dates back to the 1930s and is named for Moses Carver’s niece, Sarah Jane Williams, featuring several meditative plaques elaborating on Carver family history. While the Visitor Center is entirely wheelchair-accessible, visitors with accessibility concerns should inquire with park rangers about their individual needs before embarking on the Carver Trail. Service animals are also welcome throughout the entire facility. Visitors are encouraged to stay on established trails while on the Carver Trail and discouraged from swimming, wading, fishing, or climbing on cemetery headstones. As the park is a natural preserve area, visitors are also cautioned to be on the lookout for poison ivy, ticks, and other natural hazards, and may not remove plants or wildlife from the park. Guided tours of the monument are offered daily throughout the morning and afternoon, lasting approximately one hour and 15 minutes and including tours of the historic Moses Carver house. A variety of educational programming and demonstrations are also offered for young visitors, including hands-on reenactments of traditional farm activities such as old-fashioned laundering with lye soap and a scrub board. A natural dyes program offers art experiences with traditional mediums, and nature programming educates about the nearby plant and wildlife ecosystems that influenced Carver’s scientific findings. A Junior Rangers summer program also offers the opportunity to earn participation badges and certificates in exchange for completion of park activities.